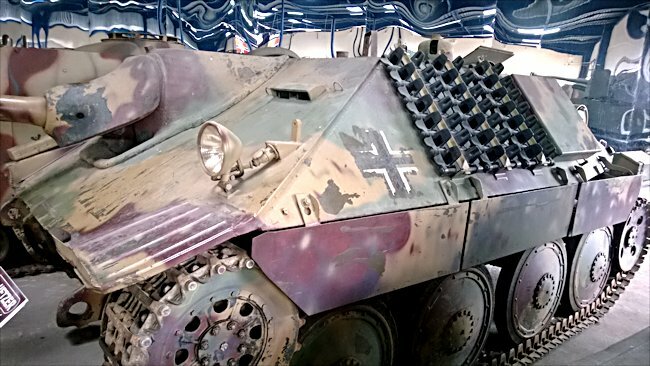 This German Hetzer Panzerjäger 38(t) G-13 Tank Destroyer can be found at the French Tank Museum in Saumur in the Loire Valley. The Museum is called Musée des Blindés ou Association des Amis du Musée des Blindés, 1043, route de Fontevraud, 49400 Saumur, France www.museedesblindes.fr . The word Blindés means armoured. The G-13 designation means that it was built after WW2 for the Swiss Army. I was very wrong in believing that the German Jagdpanzer 38(t) Hetzer tank destroyer was used during the early stages of World War Two. The reason for this belief was that the Hetzer uses the chassis of the Czech made Panzer 38(t) tank captured when Germany invaded Czechoslovakia in 1939. That tank was made by Skoda. It was used by German tank crews during the blitzkrieg attack through the Ardennes is Forest as part of the battle of France. Some of the captured tanks had the turret removed and field guns placed on the top. They became the effective Marder self-propelled gun that were used in the desert of North Africa and on the Eastern front. Midway through the war German High Command realised they needed more firepower. Allied bombing was making it difficult to produce tanks in large numbers. An easier option was to convert the now obsolete Panzer 38(t) tanks and make them into tank destroyers, with sloping frontal armour, like the new harder to produce Jagdpanther. 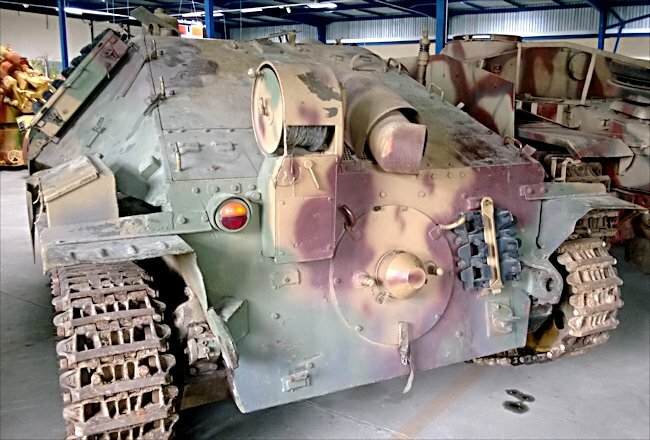 The flood light on the front of this German Hetzer Jagdpanzer 38t Tank Destroyer was a post war addition that replaced the mushroom like night light. The engineers fitted 60mm of sloping frontal armour, which gave the equivalent protection of around 120mm armour plating. Many Allied and Russian tanks had problems penetrating this armour. To keep the weight down shortcuts had to be made. The side armour was very thin, only 20mm. The tank crew knew this and had to make sure they were not outflanked and always pointed the front of the vehicle towards the enemy. The main gun was a 75mm PaK 39 L/48. The Hetzer could carry 41 rounds of ammunition. This was a weapon that could knock out every Allied tank and all the Russian tanks apart from their heavy tanks when confronted head-on. 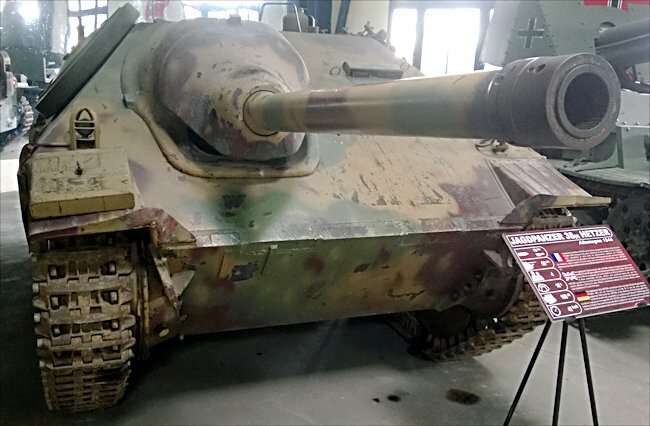 Although this tank destroyer is now affectionately referred to as a Hetzer, the German word the 'chaser', this was not a term in common usage during World War II. It was referred to as the Jagdpanzer 38(t). They were produced by a company called Böhmisch-Mährische Maschinenfabrik BMM in Prague. Strange mushroom looking thing above the front left track is a blackout light. It wasn't only the front of the vehicle that had sloping armour. If you look at the two towing eyelets at the front. They are part of the side armour. You will notice that they are sloped inwards, just like the rest of the side armour panel, towards the centre of the vehicle at the bottom. This was designed to give slightly added protection. The rear armour is also sloped. Later models of the Hetzer the armoured mantle protecting the gun was changed to the pigs head shape. This was to reduce weight as the original heavier mantle was causing problems with the vehicle suspension making it front heavy. They saved 200 kg by changing to the new design. Above the front right mudguard you will normally see a raised square rectangle. It was simply a basic block for the Jack. They did not use riveted armour plating. To make it stronger the factories welded interlocking plates together. Although the running gear, the wheels on tracks, look very similar to the Panzer 38(t) tank in fact everything is new. The wheels are now a wider diameter, 82 cm. The suspension has been strengthened to handle the extra weight at the front of the tank. To give better cross-country performance, the tracks were widened from 290mm to 350mm. At the back of the Hetzer there is a large round disk bolted to the rear armour plate. In the middle there is a metallic cone. It looks a bit like a witches hat. When the cone is removed. It reveals a hole. This is where the engine crank handle is inserted. To start the engine on the Hetzer the crew had to get out of the safety the tank and keep turning the handle until the engine started. There was an electrical starter inside the vehicle, but crews were instructed only to use this in an emergency, so as not to wear it out. Why is there a witch's hat on the rear of the Hetzer Jagdpanzer 38t Tank Destroyer? Fixed to the right and bottom corner of the rear armoured plating is a port. On very cold Russian winter mornings the engine coolant sometimes froze. A heat lamp could be applied to unfreeze the liquid using this port. The crew got into the tank by climbing up the rear of the vehicle using a handholds welded to the engine hatches. The tank commander did not have a periscope built into the tank. It was intended for him to fight the vehicle with his hatch open and his head poking out looking to targets just like on the Marder self-propelled guns. This wasn't very popular with a lot of Hetzer tank commanders. They did not like making themselves targets the enemy snipers. Most of contained handheld periscopes. Hatches were normally only closed when there was a threat from artillery. This was a design fault. On the initial designs for the Hetzer there was going to be a machine pistol port place in the front armour by the drivers position. This would weaken the protection given by the armour so this idea was cancelled. The engineers developed a remote-controlled machine gun on the roof of the Hetzer. This was a good idea and gave protection for the operator of this weapon but the problem was when it ran out of ammunition and roof hatch at the opened and a new magazine fitted, which could be hazardous. Like with most Panzer tanks, the ability for the crew to escape the vehicle quickly was helped by the large hatches. This was a good design feature on German tanks, which was not copied on many Allied vehicles. Many British, American, Canadian, Polish and French tank crews died because they could not climb out of their vehicles quickly enough. The drivers position was the most forward in the tank. He had the furthest distance to go, and the more obstructions to climb over, to get out of the tank fast if it was hit. Hetzer drivers accounted for most of the casualties. For obvious reasons hatch could not be put into the front armour. His vision, when driving was only through periscopes. New drivers sometimes have problems with the foot pedals, the accelerator was in the middle and the break was on the right. What is unique about the mounting for the Jagdpanzer 38(t) 75mm gun is that there was not enough room to have a gun mount bolted to the floor of the tank destroyer. It is suspended from the roof of the front sloping armour. It was comparatively simple armoured fighting vehicle to build compared with other German tanks and tank destroyers. BMM had built 2,047 Jagdpanzer 38(t) Hetzer tank destroyers, by the end of the war. Skoda also built 780 in 1944. This was a small, low profile, easily produced, hard-hitting cheap armoured fighting vehicle. For the Germans it was a success. The Hetzer filled a desperately needed gap in their armoury. The German army could not keep up with the mass-produce tanks of the Allies and Russians. The Hetzer helped combat the waves enemy tanks. 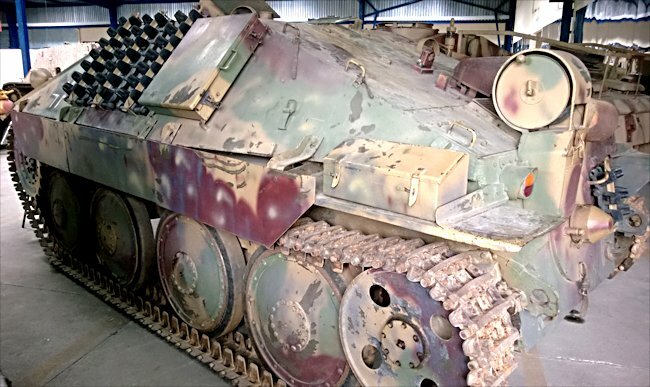 You can tell that the Hetzer on display at the French tank Museum in Saumur is a late version by the way that rear exhaust does not have a huge horizontal silencer that runs over the upper section of the rear amour plate. It is also fitted with the late-model curved Saukopfblende (usually translated as pig's head) gun mantle. The sides gave added protection as they float over the vulnerable part in the front hull where the bottom of the gun juts out of the armour plating unlike the earlier version. Also it is fitted with a Driver's vision periscope that is only protected with a sheet metal covering for the top and sides unlike the 1944 Hetzers that had a raised molded covering that became a weak spot on the frontal slopped armour and had to be replaced.